The American women focused on their gymnastics. Everyone else focused on the American women. 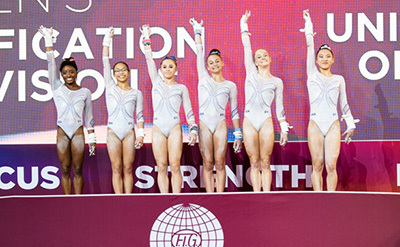 Simone Biles, Kara Eaker, Morgan Hurd, Grace McCallum, Riley McCusker and Ragan Smith made a sparkly splash Tuesday at the World Gymnastics Championships in Doha, Qatar, riveting onlookers as they turned in a competition’s worth of impressive routines during their podium training session. The U.S. is chasing a fourth consecutive World team title, and if all goes to plan, team leader Biles is likely to return from the Middle East with a handful of individual honors as well, including an unprecedented fourth World all-around title. To that end, the four-time Olympic gold medalist has come to Doha with a big new skill up her sleeve: an upgraded vault that will bear her name provided she can land it cleanly at some point during the competition. But first thing’s first. The focus is firmly on the team, which Biles underlined when speaking with reporters last week. Asked which final she’d prefer if she could only do one, Biles didn’t hesitate to name the one that involves everyone. Biles is the only holdover currently competing from the wildly successful 2016 Olympic team, which captured a U.S. record nine medals in Brazil. After nearly a year away from the sport, she returned at the U.S. Classic in July looking like she’d never missed a day of training. In Doha, she’s joined by 2017 World all-around champion Hurd, 2017 U.S. champion Smith, and newcomers McCusker, McCallum and Eaker. Five of the six will compete, with one alternate to be designated Friday, 24 hours before prelims begin. “I’m so excited to compete for this team,” enthused Hurd, who came into her own during last year’s World all-around final, where she emerged as the gold medalist after a competition in which her confidence seemed to grow with every skill she performed. Victory at the American Cup this spring and a second-place all-around finish at the U.S. Championships in August have brought that confidence to a whole new level. “I have high expectations because I know I’m capable of more than last year,” Hurd said. McCusker, whose artistic lines and stylish gymnastics set her apart, made her first World team this year after injury forced her to sit out the second half of 2017. Though “devastated” at missing last year’s Worlds, she has embraced her new opportunity in Doha. Eaker shines brightest on balance beam, where her work is as elegant as it is difficult. Her routine carries a difficulty score higher than any done by an American not named Biles, standing her in good stead in an event finals situation. Like the rest of the team, she has taken inspiration from Biles’s presence. Widely recognized as being in a league of her own, Biles continues to chase history. She and Russia’s Svetlana Khorkina, the World champion in 1997, 2001 and 2003, are the only women to have won three World all-around titles, and Biles, who won from 2013-15, is the only one to have completed the triple crown in consecutive years. With 10 World golds already to her name, the 21-year-old stands alone as the female gymnast with the most World gold medals in the history of the World Gymnastics Championships -- and by all indications, she’s just getting started.